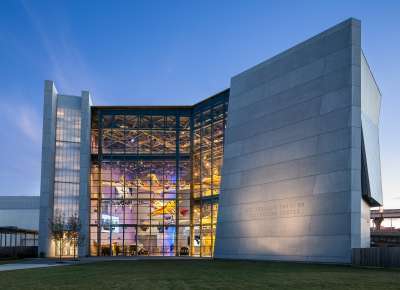 The National WWII Museum offers the following interactive, fast-paced “Virtual Field Trips” that are videoconferenced LIVE into classrooms across the country. 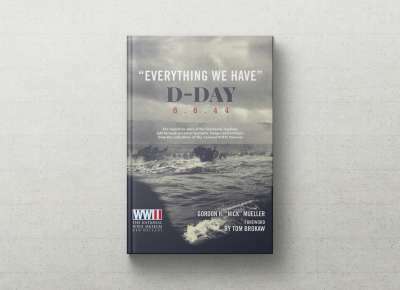 Guided by a museum educator, students analyze maps, photographs, artifacts, posters, speeches, and songs as they explore the chronologies, strategies, motivations, and outcomes behind these fascinating chapters of WWII history. Winner of the CILC Pinnacle Award for excellence in videoconferencing. All sessions last one class period and include pre-and post-program curriculum materials. Explore all of our program offerings below. Who can participate? Grade K-12 classrooms, library patrons, lifelong learning audiences (senior centers, assisted living facilities, etc). But what if my school does not have videoconferencing equipment? No problem! 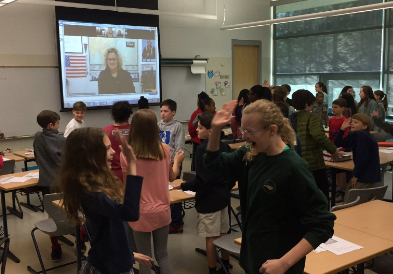 Videoconferencing equipment is NOT required to experience a Virtual Field Trip. The Museum can present any of the programs to the right to schools with very little additional technology. All you need is a computer with internet access, a projector or interactive white board and external speakers. Contact the Distance Learning Specialist for further details. Program Length: Approximately one hour (but if you have more time, we can do more). We can also accommodate class periods less than one hour. Cost: $100 per videoconference. Volume discounts available. Number of Students: These programs are designed to be experienced by one class of students at a time, so each student has more opportunity to participate. Larger groups can be accommodated. How to Book: Complete the online request form by clicking the button below. The Distance Learning Specialist will contact you to confirm your date and time. Note: Your program is not booked until the Distance Learning Specialist confirms with you via email. Additional Questions? Email the distance learning team. 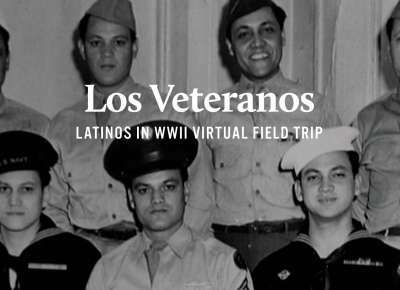 An important part of U.S. history long before WWII, the war gave Latinos new opportunities and presented them with new challenges. 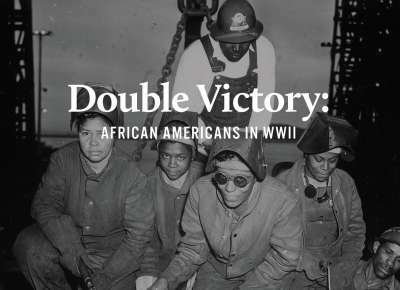 Because Latinos did not serve in segregated units, as African Americans did, their WWII history is sometimes overlooked. Was that history unique, and if so, how? Students learn about Latino WWII heroes and average soldiers, as well as issues of ethnicity and acculturation on the Home Front. This program is offered free of charge during National Hispanic Heritage Month (September 15- October 15) through generous support from Pan American Life Insurance Group, proud sponsor of Latino American Stories in Wartime. 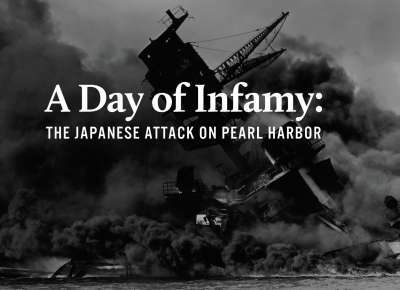 In the war that changed the world it was the day that changed the war—a “Day of Infamy.” That day brought the United States into WWII, adding the strength and determination of the American people to the Allied arsenal as it struggled to defeat the Axis. 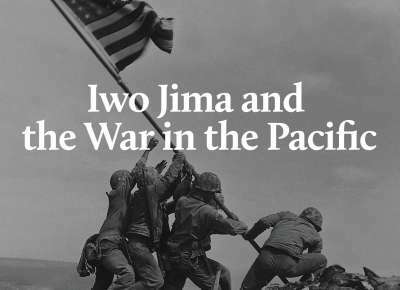 Students explore Japanese and American motivations and actions through animated maps and both Japanese and American primary sources. Students learn about the vastness of the Pacific Theater by exploring its geography. They “read” a Navy “Shellback” certificate and participate in an Equator-crossing initiation. Next they survey the Island Hopping campaign using maps and viewing video of oral histories. This leads up to the invasion of Iwo Jima. Here they explore the campaign and analyze the photograph of the flag-raising on Mt. Suribachi. Students learn to personalize history by exploring a set of artifacts from one Marine who fought there. Students receive background on Operation Overlord through maps and audio-visual presentations, explore a “Bigot” map of Omaha Beach to learn about the challenges of planning and executing Operation Overlord, make decisions about where and when D-Day should be launched, and “read” a D-Day artifact to learn about using objects to tell stories. 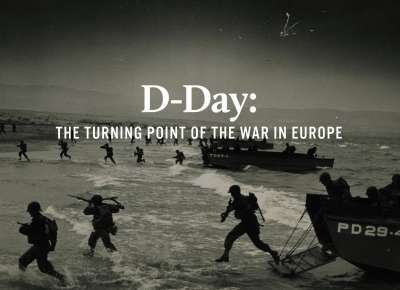 D-Day: what a difference a day makes! Students explore rationing, scrapping, War Bonds, and war production through the eyes of students. 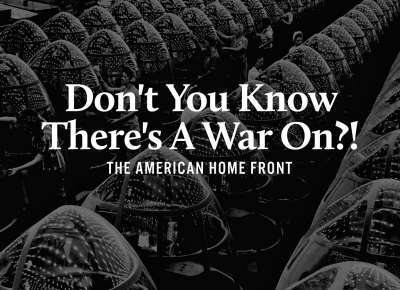 Together they find answers more satisfying than the wartime standard: “Don't You Know There's A War On?” Primary sources viewed include wartime newsreels, high school yearbooks, posters, photographs, and songs. Students learn about the triumphs and challenges experienced by African Americans on the battle fronts and on the Home Front. They meet Pearl Harbor hero Dorie Miller, the Montford Point Marines, the Tuskegee Airmen, and the seven African American Medal of Honor recipients. 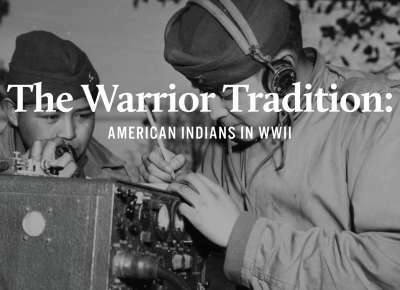 In addition to the most famous group of American Indians, the Navajo Code Talkers, uncover surprising and lesser-known stories of these warriors in uniform. Hear segments from the Museum’s oral history collection, including Medal of Honor recipient Van Barfoot,and the last surviving Crow war chief Joe Medicine Crow. With a focus on language and symbols, explore how the Code Talkers used their once-suppressed languages to successfully transmit code on the battlefront, attempt to crack the "unbreakable" Navajo code, and discuss why native language and terminology are still relevant today. When Americans were called to action, women “did their part” despite stereotyping and discrimination. The war spurred many women to enter the workforce for the first time, all while managing a household alone and upholding wartime duties. Women answered the call of Uncle Sam and enlisted in military auxiliary groups, fulfilling critical roles stateside and abroad. 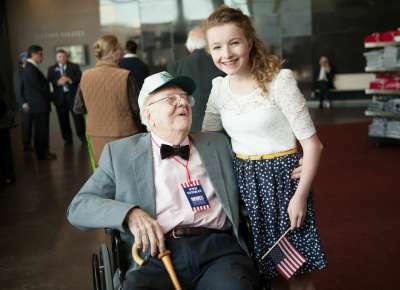 Hear accounts from real Rosie the Riveters and women near the battle fronts. 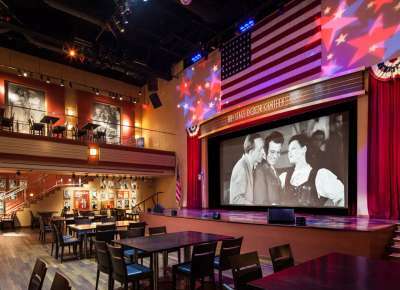 Visit the Hollywood Stage Door Canteen and discover how starlets, singers and celebrities lifted the spirits of our troops. 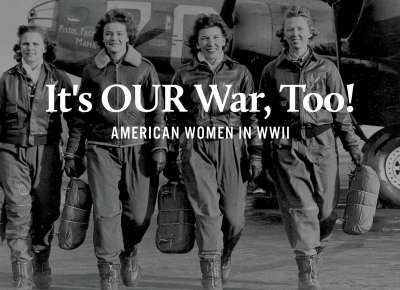 Learn about the lasting legacy of women’s contribution to the war effort. Students explore the story of Eva Hashiguchi, who spent her high-school days as an internee in Jerome, Arkansas. Through her account, witness how wartime hysteria and racial prejudice led to one of the darkest chapters of American history. 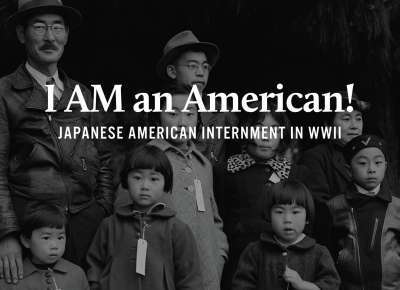 Examine the country’s actions to apologize for the injustices committed against Japanese Americans. Hear about the struggles and tremendous accomplishments of the Purple Heart Battalion. Hear personal testimony from Eva Schloss, stepsister of Anne Frank and survivor of Auschwitz. Through video recorded selections of Eva's story from the Museum's oral history collection, students will encounter the physical and emotional ordeal of going into hiding, being captured by the SS and sent to the largest concentration camp in the Third Reich. 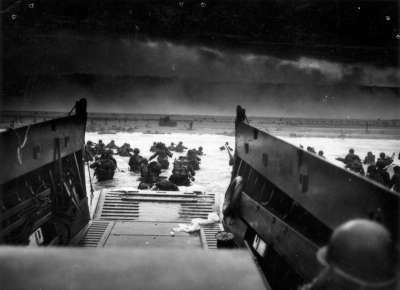 Students will understand the necessity of exploring this topic even as we approach 70 years after the war's end. 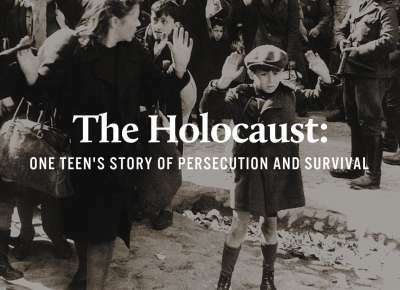 Sponsored by Taube Philanthropies and part of the Taube Family Holocaust Education Program. 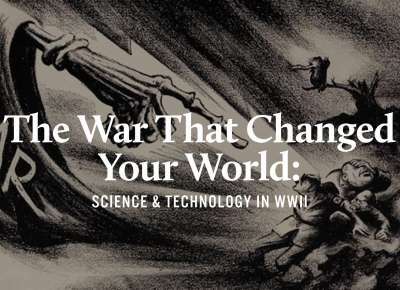 Today’s televisions, computers, and cell phones can all trace their origins to technological advancements realized during WWII. 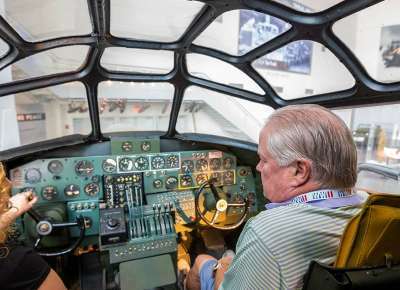 Students learn about radar, rockets, jets, penicillin, blood plasma, computers, and the atomic bomb; and how these inventions continue to affect their lives today.